This is a good week to peak ahead as you plan. This week features the stories of Samuel’s call and Nathanael’s call. Next week features the after-the-fish part of the Jonah story in which Jonah preaches to the Ninevites and they repent and Mark’s account of Jesus’ calling the fishermen (another unlikely choice) to follow him. All these call stories are similar AND different. Planning is required to avoid using up all your good points this week. This is one of the few stories in the Bible about children. So, involve the children in reading it during worship. the whole story or just the part of Samuel! F At the very least ask a 10-12 year old boy to read the story. If possible let him, like Samuel, assist in other parts of worship. He could carry in the Bible, light candles, etc. 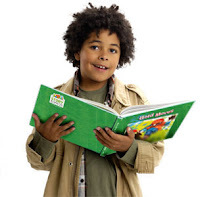 F Use the readers theater script below for a dramatic presentation of the text. Samuel could be read by a young boy and Eli by a white haired man. The Narrator might be the usual worship leader or another man in the congregation. The readers could stand in place or move around as they read following the action of the story. I included some of the movement directions, but assume readers don’t need many directions to do the back and forth between Samuel and Eli. Narrator: As Samuel grew up, the Lord was with him and let none of his words fall to the ground. And all Israel from Dan to Beer-sheba knew that Samuel was a trustworthy prophet of the Lord. In a sermon, a preacher (not one of the readers) could direct the readers in re-presenting the story, freezing them at certain points to make comments. Samuel’s call offers several ideas to discuss with children. F God speaks to children and asks them to share the message with others. You don’t have to wait until you grow up. F Listening to God is not easy. Samuel needed Eli’s help to realize that God was speaking for him and to get ready to listen. (Nathanael needed Philip’s urging before he paid any attention to Jesus.) Identify people who teach us how to recognize God’s voice – teachers, special friends or relatives, camp counselors, even other kids. This may be the time to share a story of someone who suggested to you that God might be calling you to be a minister – or to be part of the church in some other way. F Listening to God is not easy. 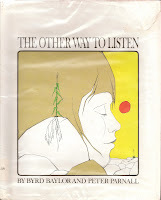 Byrd Baylor’s picture book The Other Kind of Listening tells about a young Indian girl learning from an older man how to really listen to the world around her. It is too long to read it all. 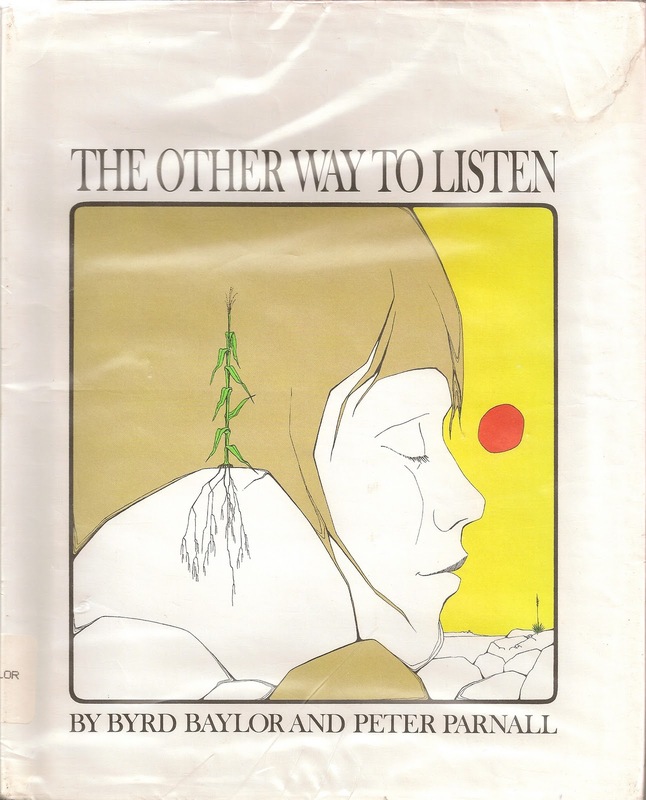 But you could read several of the opening pages about listening, then skip to the page on which she nearly gives up but finally hears the hills sing. True the girl is listening to nature, but there are real similarities to listening for God. F Identify ways God speaks. In this story God speaks through a voice that Samuel can hear with his ears. But God speaks in other ways too. Sometimes we read something in the Bible and know it is meant for us. Sometimes when we are scared or sad, we feel God very close to us helping us be brave. Sometimes when we are outside, we see something God has made and feel God loving us. Sometimes we have a feeling deep inside that God wants us to do something to take care of another person. Identify some of those ways to suggest that God speaks to each of us through all these ways as well as to Samuel. F We tend to stop this story before the judgmental message for Eli that God gives Samuel. But, when that message is clarified – because you sons have been bad priests and you did not stop them, no one in your family will ever be a priest again – and the morning-after story is dramatized (imagine Samuel tip-toeing around the Temple and avoiding Eli), children understand and are impressed. God has entrusted a difficult message to a kid and Eli listened to the kid with respect. (I imagine Samuel must have remembered Eli’s response to the message with awe for the rest of his life.) The story as a whole is one of the best arguments I know for intergenerational ministry in all parts of the congregation’s life. The chorus of the hymn “Here I Am, Lord” is based on Samuel’s response to God’s call. Today introduce the hymn with a boy soloist singing the chorus before the congregation sings the entire hymn. Or, sing the hymn responsively with the choir singing the verses and the congregation singing the chorus. The latter could be a sung Affirmation of Faith. This well known psalm is a series of short related messages. To help children understand them invite a group of children (maybe a children’s class) to read the psalm in worship. In preparing help the children put each message into their own words. In worship readers stand in a line stepping up to a microphone to read their verses if amplification is needed. There are enough verses for 11 readers. Smaller groups of readers read two or more if needed verses. Adults and teens may want to explore Paul’s message that though all things are lawful, they may not be helpful. Children will however be more interested in what Paul has to say about care and use of our bodies. There are several points to explore. FGod made each of our bodies. They are a gift and are good. This is an opportunity to counter cultural insistence that only certain sizes and shapes are OK. Point out all the different kinds of eyes, hair, or noses. Insist that God made and likes each one. Remember that children often begin hating their bodies at very early ages. Do be sensitive to children with birth defects that are very real problems. F To help children understand what Paul means when he says our bodies are God’s temples, identify all the ways we use and maintain the sanctuary. Then, compare those to the ways we use and take care of our bodies. This is obvious to adults but a stretch for literal thinking children. F If your congregation does such things, hand out children’s flyers about eating well, good health practices, avoiding drugs and alcohol, etc. The public health department can provide these. As you do, clearly connect taking good care of your body to being a good disciple or thanking God for their body. F Anybody know any great books about bodies that could be read in worship? Sing “Guide My Feet” or “Take My Life and Let It Be Consecrated” with all their mention of body parts to celebrate God’s awareness of our bodies, connect to the call stories of the day, and even recall Psalm 139. Given the more interesting story of the call of Samuel this week and the call of the fishing disciples next week, I’d tend to downplay this story with children. But, it does have several interesting possibilities to explore. F First, Nathanael is a nobody. He appears in the Bible only in the two lists of the names of the twelve disciples. In one he is Nathanael. In the other Bartholomew. Children who feel they are often unknowns in groups (maybe especially in groups at larger churches), appreciate the fact that Jesus knew Nathanael immediately, saw value in him, and called him to be one of the twelve. Jesus paid attention to Nathanael just as God called Samuel when he was just a kid to give Eli a really difficult message. F Second, on Martin Luther King’s birthday, it is worth noting that Nathanael had to get past his prejudice about people from Nazareth before he could follow Jesus. Nathanael couldn’t believe that anyone from Nazareth could say anything worth listening to. Only because his friend Philip insisted that Jesus was worth meeting, did he pay any attention at all to Jesus. F Taking a slightly different tack, friends can also help friends know God better. Eli taught Samuel what to say when God called. Samuel told Eli what God had told him, even though he knew Eli would not like it. Philip got Nathanael to listen to Jesus even though Nathanael did not believe anyone from Nazareth would have anything important to say. So, name some ways people help each other get to know God in your congregation. Also point out the possibility that each person has the potential to be such a friend to others. It's a bit of a stretch but is about a Giraffe who has been told all his life that Giraffe's can't dance and so when the rest of the jungle dances he gets left outside on his own until a grasshopper/cricket help him find his own way of dancing.